Leading British promoter Eddie Hearn is hopeful of getting final sign-off for new Matchroom Boxing recruit Oleksandr Usyk 15-0 (11) to defend his undisputed cruiserweight championship against “that nutcase from Liverpool” Tony ‘Bomber’ Bellew 30-2-1 (20) within the next fortnight. “Hopefully, this week or next week we can get that fight over the line. November 10, potentially Manchester, is the date for that,” said Hearn on the Alan Brazil Sports Breakfast. It was announced last week that Matchroom Boxing had signed Usyk to a promotional agreement. The 31-year-old Ukrainian southpaw unified the WBC, WBA, IBF and WBO titles through his participation in the inaugural World Boxing Super Series tournament with victories over Murat Gassiev, Mairis Briedis and Marco Huck. The 6-foot-3 Usyk has flagged his desire to move up in weight to compete in the heavyweight division. Matchroom Boxing promotes WBA, WBO and IBF heavyweight champion Anthony Joshua 21-0 (20). “We signed Oleksandr Usyk last week, who is the undisputed cruiserweight champion of the world. 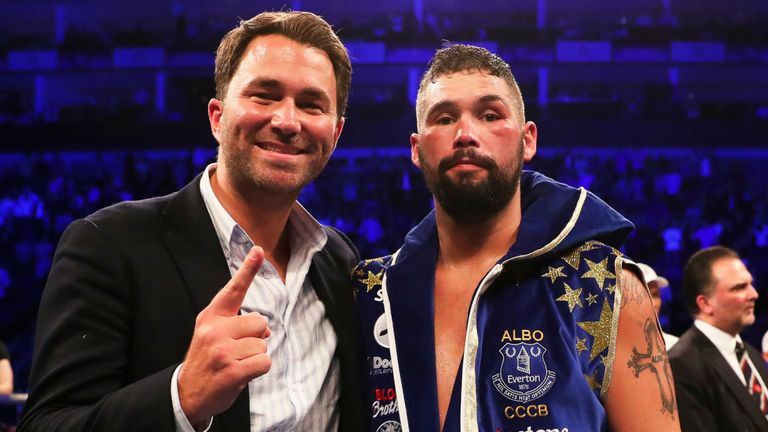 He owns every belt in the division and that nutcase from Liverpool, Tony Bellew, wants to fight him,” said Hearn. “He had two great wins over David Haye, should probably call it a day, but he’s probably better than he’s ever been and he has a chance to be a pound-for-pound great if he can beat Oleksandr Usyk. If the Usyk versus Bellew fight does take place in Manchester it will be the first time an undisputed boxing championship has been contested on British soil, according to Hearn. “I believe it’s the first time an undisputed world championship fight has ever taken place in Britain,” he said.